Our very own Pcklshelper has begun production of an as-of-yet unnamed machinima project starring himself, Wachan of <Crimson Knights> and your favorite Dwarf hunter (that would be me, if your rhetoric filter is being cleaned today), but he needs your help! If you would like to take part in the new film, message me or PC in-game and we will try to give you a job! Be prepared to make an alt, wear ridiculous costumes, do the same thing at least 3 times, and take orders from a man half your height. Also, the script is very flexible (being nearly nonexistant) so any suggestions as to minor details of the plot are welcome. See what happens when you give me unrestrained power? First I go make banners, then I take over the website, and before you know it alien lifeforms are taking over your plumbing. Crazy world. Bizarre/ disgusting creatures aside, let's cover whats been happening inside the Alliance. 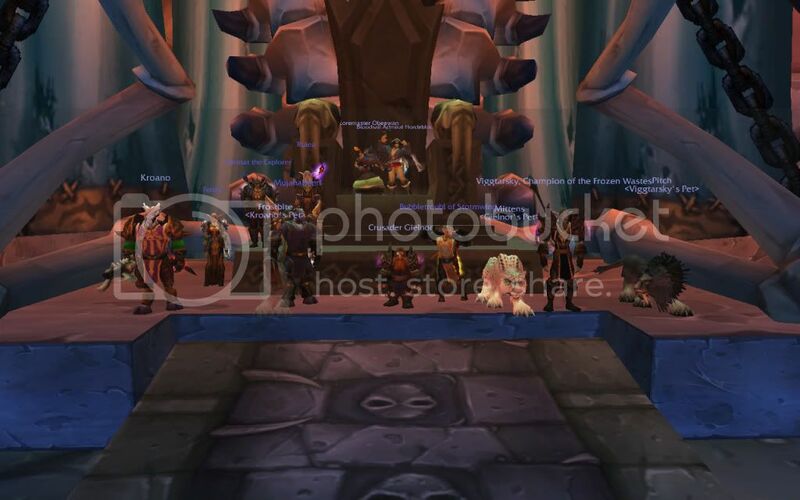 After many months of hard effort and enough wipes to wash a car, we are proud to announce that the Alliance of the Steadfast has defeated the great Kel'Thuzad on normal difficulty! Congratulations to Viggtarsky, Obeewan, Gielnor, Ruiea, Mujahadeen, Bubbletroubl, and Mentat, with special thanks to Hordeblood, Feisty, and Nomadic (on his hunter). Your hours of hard work helped make this possible. Great work! The latest guild meeting occured this Sunday. If you missed it, the review of the events will be sent out to your e-mail and posted on the forums. On that note, congratulations on Mentat for becoming our next Field Captain! Finally, we say goodbye to our good friend Tallywhacker (and his alts Bumsenbumsen, Kasstrator, and Otisrotary), who left the guild yesterday. Best of luck to all your future ventures, Tally! Remember, if you would like something to be featured here on the main page, message Gielnor (or my current alt Muushfrah) in-game, or e-mail me at megamannt451@aol.com . The next guild meeting will be on Sunday, July 27th beginning at 8:00 PM server time. If you have a proposal prepared that you would like to have discussed during the meeting, please e-mail it ahead of time to gm@allianceofthesteadfast.com or gmassistant@allianceofthesteadfast.com so that it may be included in the meeting agenda. We will be running Naxx after the meeting at 10:00 PM server time. Thaddius and the entire Plague quarter remain, so put on your dancing shoes and lets see if we can get saph and KT on Monday! 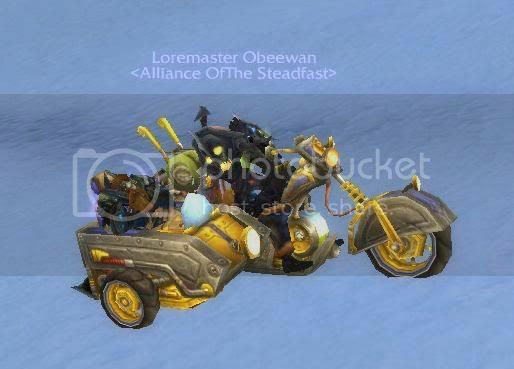 Congratulations to Obeewan for grinding the massive amount of gold needed to construct the [Mekgineer's Chopper]! This baby purrs like a kitten. That's all the news for now! Check in regularly, both here and on the forums, to see whats new both in the guild and around Azeroth. And if you would like something posted here on the front page, please e-mail me at megamannt451@aol.com, but please make sure it pertains to either the guild or its members (Yes, that includes you! ).